Following on from last week’s recipe of the week from Katia, this week we’re sharing the first of several trout recipes from Ciara of the gettingfedup.com blog. Ciara has come up with an interesting combination of potato cakes and our award winning Goatsbridge Trout Pate and Caviar that we’re looking forward to trying. We hope you’ll give it a go too. Grate the potatoes into a bowl. Melt the butter add it to the potatoes along with the flour, parsley, onion powder, salt and pepper. Mix well to combine. Place a frying pan on a medium to high heat and while it is heating up, start to form the potato. Use your hands to pat the potatoes into little cakes. Add the oil to the pan followed by the potato cakes. Let the potato cakes cook for about 3 – 4 minutes on each side or until golden brown. While the potato cakes are cooking, take the bacon and roll it up into a little cylinder shape. Using a tongs, place it on to the frying pan, holding it for about 30 seconds so that it retains its shape. Continue to turn so that it cooks through evenly and colours evenly all over. When the potato cakes have finished cooking, transfer them to a serving plate. Spoon over the ‘Goatsbridge Farm Trout Pâté’ and place the rolled up bacon over the pâté. Finally, garnish with the ‘Goatsbridge Farm Trout Caviar’ and a sprinkling of fresh parsley for that extra touch of elegance! 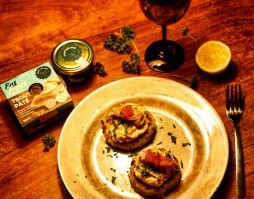 If you liked this easy to follow recipe you can buy our trout pate and trout caviar from our online shop. Goatsbridge trout products are also available in all good Irish supermarkets, including Supervalu and Dunnes Stores as well as specialist shops around the country. For more Goatsbridge trout recipes, news or competitions sign up for our newsletter.